We have an available stock of more than 600 colored threads to help to craft a high definition woven badge. With our professional weaving craftsmanship, contemporary fashion concepts in weaving design and an available of a wider range of vibrant colours option, we believe our customized woven badges will create an outstanding identification of your brand products. The threads we use is the ultimate thin thread, it can achieve greater definition, and smaller, intricate weaving detail. Our woven badges quality is hard to beat. The advantage of our thin threads is that it can weave a sharper definition weaving image, a great choice for smaller woven badges. We create the gentle balance of extreme elegance, well-defined personal style, and high-end brands weaved badge. We can offer badges in satin quality, high definition damask weaving quality, as well as a shiny metallic threads to create an extra weaving feature. 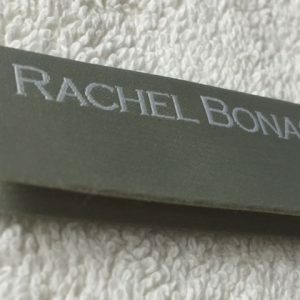 – Laser cutting can create any irregular shaped badges, totally sealed edge. – Special backing: Non-woven paper backing or heat seal, iron-on backing.